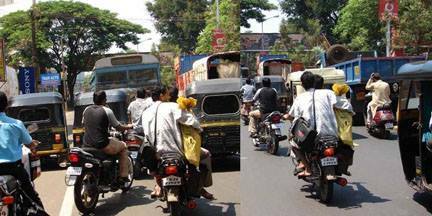 In the wake of the recent focus on traffic rules and traffic sense, a few issues that come to mind….. I shall consciously make sure that i inform others to do the same whenever I see them not following the minimum precautions that need to be taken….BOTH In person and on social media. 1)Pedestrians Should walk on the footpath if it’s present and govt should construct wherever they are not. 2)Again The Pedestrians should cross the roads where there are Zeebra Strips. I hav seen/experienced some ppl cross moving Vehicles As if like the vehicle has flagged of n they are racing ? Thanks a lot for such a good message, All people should be adhere to traffic rules. Compliments for highlighting the need for incorporation of more and ‘relevant to time’ oaths. It is unfortunate that in Belgaum a pedestran has to look at both ways in a one-way road to ensure a safe crossing. Even our pride NH4 is also not spared (eg traffic comes from Santhesh motors area to HESCOM area) every day in opposite direction in the absence of a service road in this small 1 km stretch. We citizens have to step up our efforts to create road safety awareness. Yes, Sameer sir this was needed.. For all, for me too.. I too didn’t follow a couple of points mentioned.. Will try my best to mend my deficiencies in following the traffic rules.. Although I know these.. It’s quintessential to read these once everyday, and literally byheart it like school children!! Then only on road we will be reminded, and we will follow.. Yes, Uday this is needed.. For all, for me too.. I too didn’t follow a couple of points mentioned.. Will try my best to mend my deficiencies in following the traffic rules..
Great write up…lets practice what v preach.. Very good message uday. Each one should take their own responsibility. Thank you for making people aware.